Christian, a young poet, leaves his respectable background behind when he moves to the bohemian underworld of Montmartre. Taken under the wing of the hedonistic artist Toulouse-Lautrec, he becomes a regular at the notorious nightclub, the Moulin Rouge, where he falls under the spell of Satine, the most beautiful courtesan in Paris, and the star of the show. 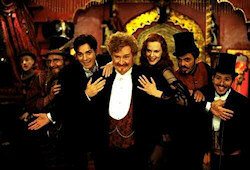 From the first frame of this film, Moulin Rouge screams along at breakneck pace with loads of pastiche musical numbers. The Tenenbaums are an eccentric New York family. Actually, they're extraordinary--all geniuses. Royal Tenenbaum (Gene Hackman) is a successful litigator. His wife Etheline (Angelica Huston) is an ambitious archaeologist. His daughter Margot (Gwyneth Paltrow) is a gifted playwright. His son Chas (Ben Stiller) is a masterful businessman with a taste for real estate. And his other son Richie (Brian Wilson) is a natural tennis champ. However, when Royal packed up his life and left his wife and his family in a cloud of betrayal, everything fell apart. Twenty years later, he feigns illness as an excuse to reunite with his estranged family. The exciting, chaotic behind-the-scenes dramas of a TriBeCa Italian restaurant are lovingly brought to life in Dinner Rush. Director Bob Giraldi creates a rapid-fire tale of gangsters, gourmet food, high-flying chefs, bookies and obnoxious patrons: all made real with snappy dialogue and an experienced ensemble cast. 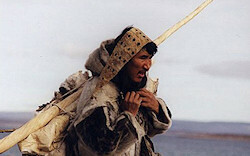 Evil in the form of an unknown shaman divides a small community of nomadic Inuit, upsetting its balance and spirit. Twenty years pass. Two brothers emerge to challenge the evil order: Amaqjuaq, the Strong One, and Atanarjuat, the Fast Runner. Atanarjuat wins the hand of the lovely Atuat away from the boastful son of the camp leader, Oki, who vows to get even. Oki ambushes the brothers in their sleep, killing Amaqjuaq, as Atanarjuat miraculously escapes running naked over the spring sea ice. It is November, 1932. Gosford Park is the magnificent country estate to which Sir William McCordle and his wife, Lady Sylvia, gather an eclectic mix of relations and friends for a weekend shooting party. As the guests assemble in the gilded drawing rooms, their personal maids and valets swell the ranks of the house servants in the teeming kitchens and corridors below-stairs. An exuberant family drama set in Mira Nair's beloved Punjabi culture, where ancient tradition and dot com modernity combine in unique and perfect harmony. As the monsoon rains loom, the extended Verma family reunites from around the globe for a last minute arranged marriage in New Delhi. Monsoon Wedding, traces five intersecting stories, each navigating different aspects of love as they cross boundaries of class, continent and morality. The film celebrates a contemporary India never before seen on screen. Kandahar is based on the true story of an Afghan woman who had escaped the Taliban to become a journalist in Canada, and then attempted to return to save a despairing friend (her sister, for the movie) who had threatened suicide. That fact, along with the non-professional cast and stretches of halting English dialogue, gives the piece a semi-documentary feel: much of the narrative was improvised while Makhmalbaf travelled with his crew around the Afghan border. Joe Moore (Gene Hackman) has a beautiful young wife, money owed to him, and a job he loves. Heâ€™s a thief. His job goes sour when he gets caught on security camera tape. His fence, Bergman (Danny DeVito) reneges on the money heâ€™s owed, and his wife (Rebecca Pidgeon) may be betraying him with the fenceâ€™s young lieutenant (Sam Rockwell). Moore and his partner, Bobby Blane (Delroy Lindo) and their utility man, Pinky Pincus (Ricky Jay) find themselves broke, betrayed, and blackmailed. Moore is forced to commit his crew to do Bergmanâ€™s one Last Big Job. This is the mournful fable of the Santa Lucia School during the last days of the Spanish Civil War. An imposing stone building set on a desolate plateau, the school shelters the orphans of the Republican militia and politicians, and other abandoned children. Upon his arrival at Santa Lucia, ten-year-old Carlos (Tielve), is confronted with the hostility of Jaime (GarcÃ©s), the oldest of the children and clearly the leader of the malnourished troupe of orphans. Aggressive and greedy, Jacinto is filled with hatred for the school that houses him and the teachers that raised him. 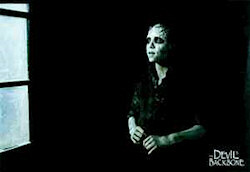 Gradually, Carlos uncovers the dark ties that bind the inhabitants of the school, including the secret that haunts them. On the secluded Isle of Jersey in the final days of World War II, a young woman waits for her beloved husband to return from the front. Grace (Nicole Kidman) has been raising her two young children alone in a beautiful, cavernous, Victorian mansion, the one place she believes them to be safe. But they are not safe. Not anymore. The Others is a chilling tale of psychological terror that begs the question of who to trust, what to fear and what to believe. 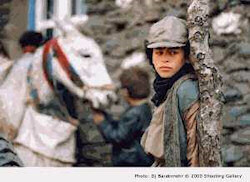 The story takes place in a remote, mountainous area near the Iran-Iraq border in the Kurdish region of Iran. Ayoub, a hard-working adolescent, along with his three sisters and two brothers live a harsh life of economic deprivation. Their mother is dead and their smuggler father is away. Every day Ayoub and other village boys compete for a trip to a small town, where they are used for an assortment of odd jobs, including smuggling goods under their clothes. The opening car-chase sequence of this movie delivers the kind of unapologetic rocket-fuelled rush of excitement not experienced since the days of Tarantino in the early 1990s. Three inhabitants of a car are being chased through Mexico City by a gun-wielding gang in a truck. One of them, Cofi, has taken a bullet; Luis is pressing his hand up against the wound to staunch the flow of blood. Cofi is a dog, the pampered champ of a high-rolling dogfight, and has just been made the subject of what amounts to an unsuccessful assassination attempt by a rival trainer in the middle of a contest; it's an incident which has led to the inevitable grisly confrontation between two sponsors of the sport of underworld kings. Together is about a commune in Sweden in 1975, occupied by a bunch of hippies who give their children names like Tet, after the Tet Offensive. Their merry utopia is called Tillsammans or Together - that is how they solemnly answer the phone - and it has its very own horrific VW camper van with an appalling mural-type decoration. When two of its inhabitants defect to the rival "Mother Earth" commune, a similar VW van arrives to pick them up with its own mother earth logo and hippie imagery. Tensions escalate when the commune's bearded and saintly leader Goran, persuades the overcrowded community to accept his sister Elisabeth (Lisa Lindgren), a battered wife with a bruised face, a split lip and two children.